Okay, seriously. How are we halfway through October. LIKE, JUST NO. If I'm being honest though, I'm sort of excited because well, Christmas. I'm sorry guys. Can't help it. 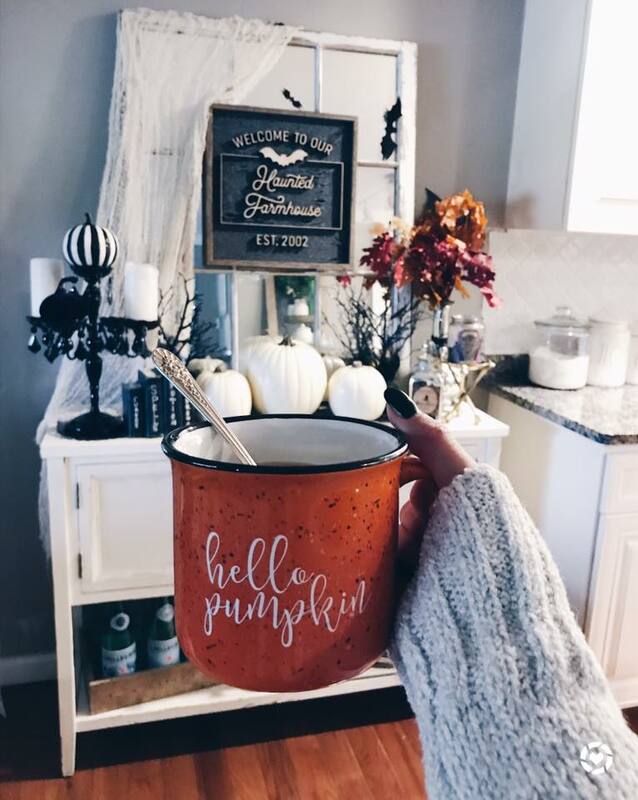 We still haven't even been on a hay ride, to a pumpkin patch or through a scary haunted house yet this fall season, I really need to get with it. We're going to try to cram all of it in this weekend. I'm excited! It's finally starting to feel like fall here in Maryland and I can't wait to get out and enjoy it. I'm just going to hop right into some of my favorite finds and things this week. I was super excited to see the tray I have under my Rae Dunn canisters at my coffee station is available again! I get asked about it pretty often so I was excited to see that it was back in stock. I love this tray because it has a vintage feel and is the perfect size for the canisters grouped together, it props them up a little more so that the space feels more put together. You can check it out here. I shared some of my favorite clothing finds of the week in my Instagram Stories, and I'm excited because the sweater I raved so much about is on SALE. I'm not a fashion blogger guys, and I typically just wear whatever is comfortable, but I still like cute stuff. 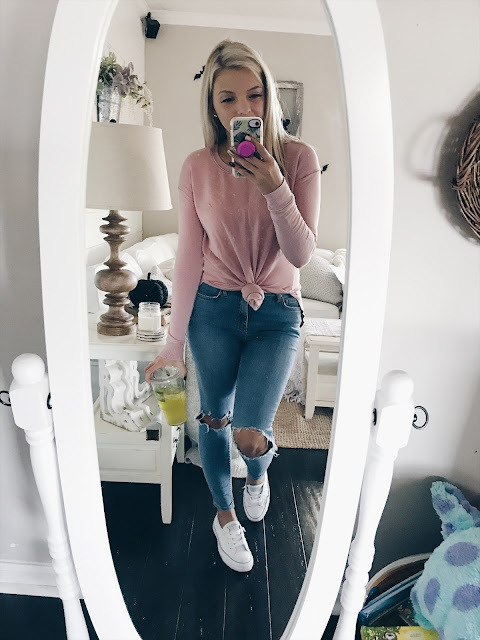 This sweater is perfect because it's soft and long enough enough to be worn with leggings (or jeggings) but also cute enough that you can throw it on with some jeans. Speaking of jeans, these are my new favorites by far! I'm not a fan of spending this much money on jeans but you guys, SO WORTH IT! I'm short so, it's tough to find high rise jeans that come up just the right amount on my without making me feel shorter than I already am. These are super soft, stretchy and have perfect "knee hole" placement! I ordered in two more colors just because I'm worried they'll sell out or stop selling them. 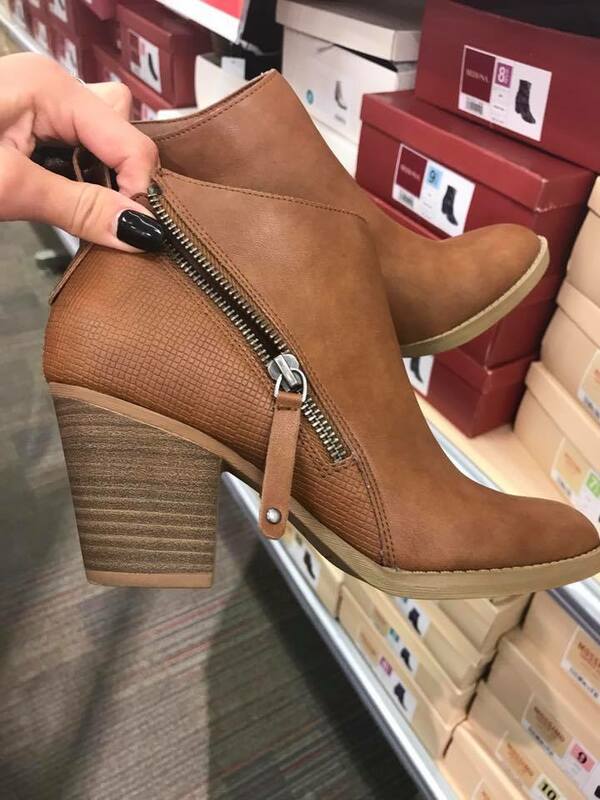 I feel like everyone needs these booties for only $30! Not only are they cute, they're comfortable too! A great dupe for some similar pairs I've seen and tried out and ahem, much more expensive places! Also get asked a few times a week about this mirror, I love it! And it's under $50. I like that it's easy and light I that I can easily move it, but also like that it fits in with the farmhouse style theme I have going on here. You can check it out here! I'm obsessing over campfire mugs and have been asked a ton this week about this one I got from Pretty Collected. I can't wait to get my hands on a few Christmas ones, how cute is this witches brew? I NEED all of them! 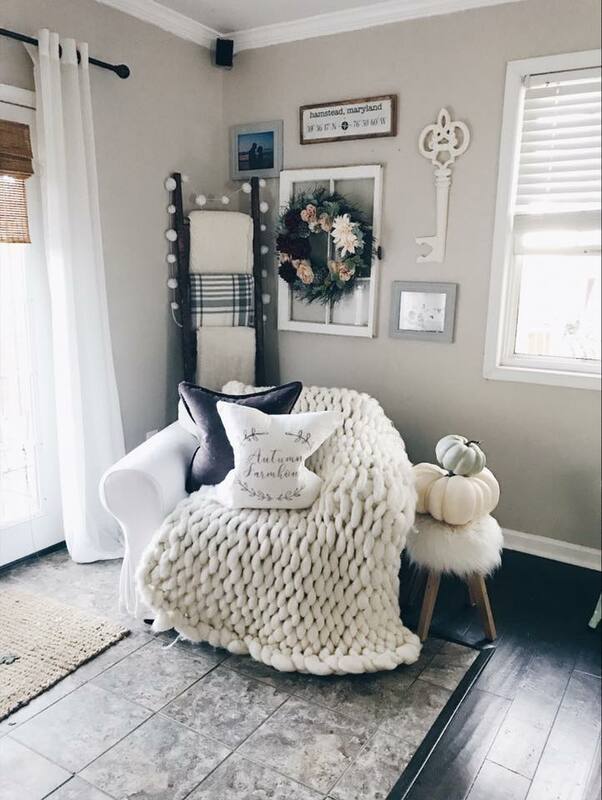 I know lots of you have been asking about this yummy chunky knit throw blanket I got from Artizen Home, but I get that it is expensive, and while I 100% Believe it's gorgeous and worth the money I wanted to find an alternative more budget friendly option for those of you looking to get a similar look. this one is only $30, and has a similar knit pattern, and this one here is super similar and less than $100! If you're looking for a GREAT Halloween read- this book is for you! How To Hang A Witch is one of my favorite books and I read it every year around this time. It's such a great quick read and it's for sure a page turner, so snuggle up with a cup of coffee or a glass of wine and DIVE IN! I think you'll love it! Also, wanted to let you guys know that my favorite tray is back in stock and ready to ship! It comes and goes periodically but I wanted to share for those that have been asking but haven't had a chance to get their hands on one yet! Whew, I didn't realize I had so much to share this week! Who knew! I'm working like heck to get the master bedroom at least presentable, this weekend was busy with running the kiddos around, but I can't wait to show you guys the completed space! I sure hope you all have a great weekend! Thanks for always sticking around and being so supportive of me and all of my adventures, It really does mean so much to me and I am so thankful everyday! PS. this post contains affiliate links, as always all opinions are my mine and mine alone. Thank you for making this little blog possible. Those booties are SO cute! Happy weekend, girl! Such a fan of the campfire mugs! Happy weekend and here’s to getting the fall stuff done! For soon it’s Santa time! The BEST and Easiest Pot Roast Recipe EVER! Friday Favorites & Catch Ups! The BEST Leggings to dress up or down!